it's just that i am in new york for the national stationery show (also for eating fantastic pizza and even better cake). and then after new york it is off to maine, and then after maine i'm heading down south to north carolina so the blogging might be, um, well, a little lighter than normal (or just non-existent). however i do have a minor obsession with twitter, so feel free to come and follow me on my east coast adventure. it will be fun, i promise. that pizza looks ahhhhmaazing. it's weird but there are some really good pizza places in Mexico!? random I know! haha. but this looks soo goood too bad im on my vegan kick again. that pizza looks awesome! Wish i could have gone to the stationary show! oh bliss! Have a great adventure! 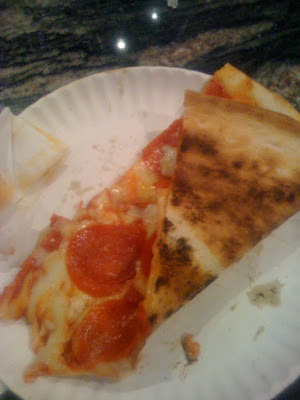 I see that you've folded your slice, just like a respectable new yorker!